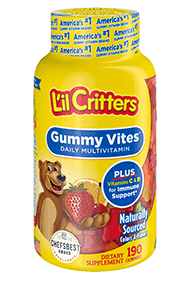 Start your day off right with an exciting new product from America’s #1 Gummy Vitamin Brand: L’il Critters™ Organic Complete Multi! Made with 11 essential vitamins in a natural mixed berry fruit flavor, L’il Critters™ Organic Multi provides a wholesome fusion of nutrients and USDA certified organic ingredients. These power-packed vegetarian gummies deliver nutrition you can feel good about. Best of all, L’il Critters™ Organic Multi gives you the nutrients you need without anything extra -- because what’s in our gummies is as important as what’s not! No wonder Kids Love ‘Em and Parents Trust Them.